Most of us have developed a variety of different ‘bios’ for different purposes. 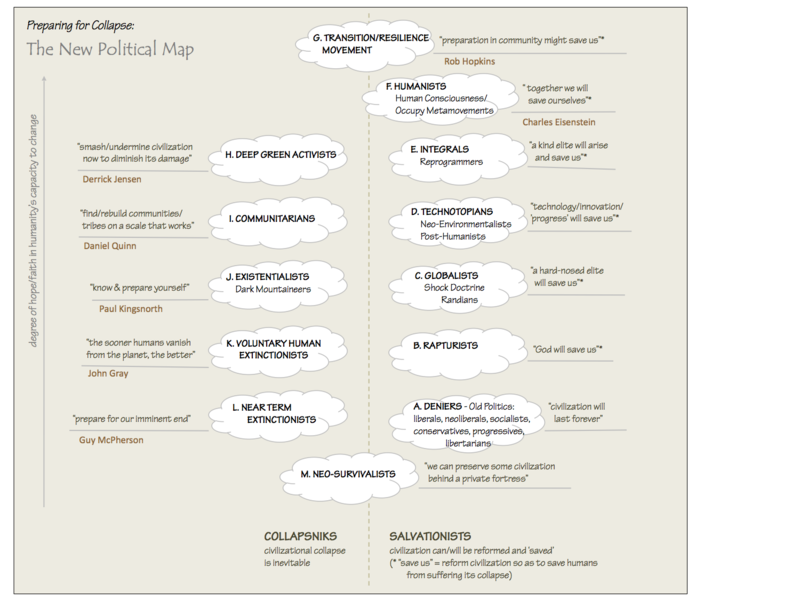 We have one for work, that basically describes our acquired skills and experience and what we ‘do for a living’. We have one for meeting new people socially, whether that be on a dating site or just something we relate at cocktail parties or potlucks. (For most of us, thankfully, that is no longer mostly about what we do for work.) It is more likely to be aspirational — what we want to do in our future, and who (known or not yet met) we hope to do it with, though it likely also includes some data like our marital and family status. And then we have a third ‘bio’ that is the story we tell ourselves, and selectively our loved ones, about ourselves. It’s about how we define ourselves: what we love and care about, our purpose and intentions, our philosophy or worldview, and the adjectives and other ‘labels’ we assign ourselves. Trying to combine these three bios is a messy business. They have different ‘audiences’ and there are many things about us each audience just doesn’t want to know. And most interestingly, each has a different predominant tense: the work bio is past-tense focused (what have we shown), the relationship bio is future-tense focused (what are we looking for), and the self-bio is present-tense focused (who we really are, right now). Sadly, because most of us live such busy and struggling lives, the third bio is probably for most the least developed, the most unknown. When I was interviewing people, or looking for suppliers at work, I looked at their (mostly past-tense) bios, but I found I really didn’t care about them very much; people selling their services generally know if they have what it takes, and tend to self-select out of the application pool if they don’t think they have what’s needed. So when I was interviewing, I generally took it for granted that the applicants were qualified. What I wanted to know was a bit about their aspirations (to know if they would likely stick around long enough to have been worth hiring), but mostly I wanted to know about who they were right then — what they cared about, what they had passion for, what their personal ‘purpose’ was. That’s what differentiates people most, and what I wanted in work colleagues was shared passion and purpose. Those are the people we want to work with, and who will want to work with us. But it’s awkward getting to that: We can’t just baldly ask someone, in an interview (or a cocktail party or potluck) what they care about. It sounds too nosy, too personal. Besides, many people really have no idea what they care about, what their personal passions and purpose is, so asking them is just putting them on the spot. Likewise, when I belonged to OKCupid, the alt-culture dating site, I looked at their (mostly future-tense) bios, but I found I really didn’t care about them very much either; they were useful for eliminating inappropriate potential partners (in my case, those looking for the one perfect person to “complete” them, or looking to have children, or demonstrating a high level of neediness, or lack of intelligence, creativity, curiosity, self-knowledge or self-awareness) but not for identifying people with whom I might have an extraordinary connection. The list of what people like to do ‘in their spare time’ is not very helpful, either, since it really relates to their past story and what they’ve stumbled on that they’ve found valuable enough to continue doing. Knowing someone likes birdwatching or hang gliding or even shopping doesn’t really tell me if I’m going to enjoy their company. No, again, I want to know what they care about, what their ‘purpose’ and passions are — not whether they like seeing a rare Meriwhether’s Falcon, but rather whether they like studying birds’ behaviour to see what it teaches us about our own. Not whether they have liked something they’ve seen or done in past, but whether, based on their stated passions, whether there is something we’d likely like to do together right now. So how can we tactfully and skillfully ask these questions that unearth who people really are right now, so that we can discover quickly whether the person we have just met is destined to be our brilliant colleague, life partner, inspiring mentor or new best friend? Asking them to tell their story is precisely the wrong way to do this, in my experience. Most people (including me) are terrible story-tellers, and their stories tend to dwell on past facts and details that mostly have no bearing on what they care about or who they are now, or why. And most people love to tell their stories, because it’s easy and comfortable and they can censor out whatever they don’t like, or think you won’t like. Most people’s stories are polished fiction. What adjectives or nouns would you use to describe yourself that differentiate you from most other people? When and how did these words come to apply to you? Describe the most fulfilling day you can imagine, some day that might actually occur in the next year. As you describe each event in the day, explain why it would be so fulfilling to you. What are you doing each day that might increase the likelihood of such a day occurring? What do you care about, right now? What would you mourn if it disappeared? What do you ache to have in your life? What would you work really long and hard to conserve or achieve? How did you come to care so much (now that’s a story worth listening to)? What is your purpose, right now? What would elate you if you achieved it, today, this month, in the next year? What would devastate you if you failed, or didn’t get to try? How did this become your purpose? What’s your basic philosophy or worldview about why you, and other humans, exist? Not what you believe is right or important (or what you, or humans ‘should’ do or be), but why you think we are the way we are now, and why you think we evolved. It’s an existential question, not a moral one. How did you come to this philosophy? What’s your basic philosophy or worldview about what the next century holds for our planet? What do you see as your role and approach to dealing with that eventuality? How did you come to this philosophy? It seems go me that the best way to broach these questions, without seeming too abrupt, with someone you have just met or are just getting to know, is to go first. Be an example of openness and candour that makes it easier for others to follow. I would volunteer my own answers to these questions, probably in the order they are above (i.e. simplest and easiest first), by prefacing my answer with something like “someone asked me the other day…”. I would answer only the question in bold, unless prompted to elaborate, and then leave open the space for the other person to proffer their own answers. Once they did, or if they tried but struggled, I’d throw out the supplementary questions, especially the story-evoking ones in italics that elicit stories. That’s it. My newest idea for avoiding small-talk and useless bios, and hopefully finding more meaningful connections more quickly and reliably. So let me tell you what I care about, my purpose, my sense of who I am and how I see us, now. And then, rather than telling me your past or future story, tell me who you are and what you care about right now. If we find we care about very different things, then we can part company politely, knowing that. And if we find our answers to these questions largely overlap, who knows what might be possible? My answers to the 6 basic questions follow. If you want to know the why’s and how’s, that the subject for another conversation. I am above all hedonistic, vegan, deschooled, unspiritual, joyful, imaginative, curious, and reflective. The decision to put hedonistic first is new and deliberate. Etymologically it means “attuned to sweet and pleasant things”. It in no way means shallow, reckless or insensitive. It acknowledges that there is only now, and that ‘just being’ — aware in this moment of what is — sensing and responding presently, intellectually, emotionally, sensuously, and intuitively, is probably the most honest, appreciative and authentic way of being anyone can aspire to. My perfect day would be spent gently exploring wild and beautiful places, talking, eating, playing, making love and co-creating things with a small group of physically, emotionally and intellectually strong, fit, self-aware and beautiful people. I care about the ongoing sixth great extinction of life on Earth, and the suffering it is causing. I care about making every moment of this short and amazing life count. I care about knowing how I, and the world, really ‘work’ and how I can be of use to all-life-on-Earth in the years I have left in ways that make a real difference. For now, my purpose — what drives me — seems to be making the women in my life that I care about, happy, in any way that I can. That may sound strange, but it seems true for me, and brings me a lot of joy in return. I believe we have evolved, each creature in its complex container of cells and organs, to experience the pure joy of being alive. Just that. Just to be, joyfully alive. Nothing spiritual in that — life emerged as an accident and has since deliberately been working to perpetuate itself when life is joyful and to extinguish itself when it is not. Because of living far beyond our material means, exhausting the planet’s resources on which we depend, and polluting the planet beyond its capacity to cleanse itself, I believe human civilization will collapse in fits and starts, globally, over the coming decades and centuries, until what remains of humans is a small number of people living diverse, simple, tribal lives a few millennia from now, without infrastructure, hierarchy, technology or even connection with other tribes. I have to believe theirs will be joyful, leisurely, sustainable lives, which is more than we can say of our wonderful, terrible civilization. Dave by looking for connection aren’t we just admitting separation? But there is nothing to connect because we were never separate from the other. Is that not a curious thing? 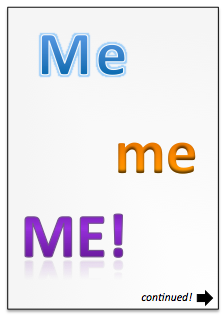 Why should we encourage judgementalism and agenda setting in a me, me, me framework? Shouldn’t we take a step back from linguistic styles of interacting with others? Well Dave, I have to say I’m immensely grateful you asked! 1. What adjectives or nouns would you use to describe yourself that differentiate you from most other people? When and how did these words come to apply to you? Hmm… mostly adjectives! Perhaps because ‘who’ or ‘what’ I am is dynamic, and ways of being seem to fit more with dynamism than definitions do. Or maybe I’m full of crap and just Overthinking what came to me without effort? 2. Describe the most fulfilling day you can imagine, some day that might actually occur in the next year. As you describe each event in the day, explain why it would be so fulfilling to you. What are you doing each day that might increase the likelihood of such a day occurring? My initial reaction to this question was ‘I have no freaking idea!’ And then I just started to think… perhaps I’d be fulfilled by spending a day doing simple things I love – I’d spend time in the sun, in green and tranquil space, under the big sky, walking (maybe alone, maybe with my partner – depending on my mood at the time). And I’d cook for (not with) loved ones with healthy, appreciative appetites – and I’d be happy to immerse myself in the process for hours. And I’d eat slowly (with said loved ones), savouring the palette flavours nature offers up to those who take the time to notice. And I’d be surrounded by the love of my cats – Derek and Valerie have a great deal to teach regarding simplicity. I might add to the joy with music – and if I feel a burst of joy I’ll probably get my groove on by singing and dancing along. And I’d spend limitless time reading and writing – because limitlessness is what enables me to truly relax, immerse, and enjoy. And you know what? Since I started to take life more slowly and pressure myself less with work and ‘world-saving’ antics, this is pretty much how I spend my weekends. So, minus the errand-running and the cleaning, I have perfect days most weekends. I want for very little. What I really want but don’t have in this mix is the feeling that all is well in the world, because it’s not. There is too much suffering and hardship for me to feel at ease at all times. So, what am I doing each day to increase the likelihood of feeling at ease one day? I devote most of my days to doing what I can for the various causes I honour – be it frontline activism, awareness-related action, or education-based facilitation of others’ involvement in the cause. It never feels like enough, not remotely, but I have learned to apply myself where my skills and interests fit, rather than just plugging the most immediate gaps that seem to need someone’s attention. I don’t get that right all the time – maybe not even most of the time – but I am at least appraising my actions better these days, and trying to strip my contributions back to what I can best offer. 3. What do you care about, right now? What would you mourn if it disappeared? What do you ache to have in your life? What would you work really long and hard to conserve or achieve? How did you come to care so much (now that’s a story worth listening to)? I care about the natural world – particularly the animals that make up a large part of the web of life, and the structures and systems that support those lives. I mourn the disappearances of those species that go extinct each day, I mourn the destruction of habitats that leave countless Earthlings vulnerable, I mourn the individual deaths of innocent beings who have no business being the victims of our attempts at vicarious salvation – our desperate quest to maintain our way of life at the expense of the web of life. And I mourn the human victims of our way of life. And by ‘our’ way of life, I mean our post-industrial, western, colonial, post-enlightenment, anthropocentric delusion. I ache to feel the calm of one simple strand in nature’s web of life – connected to, not undermining, the rest. While so many of my species, my culture, continues to build temples to its own flawed self-image in lieu of simply participating, I am compelled to swim against the current. I am tired. Not only would I work really long and hard to conserve our precious web of life, but I do. The question of how I came to care so much is, I think, more one of not growing up and into something/someone that stopped caring. I don’t buy into our anthropocentric delusion, and am prepared to fight any attempts to coerce me into living a lie. 4. What is your purpose, right now? What would elate you if you achieved it, today, this month, in the next year? What would devastate you if you failed, or didn’t get to try? How did this become your purpose? My purpose right now is to help other people to break free from the myths and delusions of our culture. If I achieved this I could die happy – although I’d much rather live longer and enjoy such a world that could spring from this death of delusion. I won’t achieve it though. I will just keep striving to help others (does that make sense? I sometimes feel as though I’m trying to make others be as I want them to be, perhaps a hangover from my days teaching students to shave off their round-peg edges to fit into society’s square holes… ) strip away myth and delusion in order to live a life that’s in tune with all life. I know I will fail in the overall goal, so I can only pare it back to a series of steps with the achievement generally being the acceptance by a few people of the challenge/s I pose. I am devastated already by the consequences of inevitable failure, but I am grateful that I have found the courage to stick my neck out and try. I think this was always my ‘purpose’, and I can’t really remember a time when it wasn’t (even as a kid I used to stick up posters around my primary school, imploring people to cherish the only Earth we have and to care for all Earthlings upon it, and I never stopped picking up other people’s trash…). But to answer the question of how it became my purpose is absurdly sensible: it’s just obvious that where there’s a need there’s a desire to fulfil it, and I’ve always had an immense sense of responsibility to respond to such needs (and am haunted by guilt when I don’t perform my responsibilities, or fail to do so to the standards to which I hold myself… this is all material for another post… coming soon…). 5. What’s your basic philosophy or worldview about why you, and other humans, exist? Not what you believe is right or important (or what you, or humans ‘should’ do or be), but why you think we are the way we are now, and why you think we evolved. It’s an existential question, not a moral one. How did you come to this philosophy? I think it’s as simple as it was inevitable: it just happened this way. I don’t think there’s any reason for why we are here, and I don’t think there’s any purpose to it. I think that we can make our lives full of meaning, and live according to a purpose that resonates with us, but I don’t think this comes from any real cause, intention or purpose inherent in the universe. I suppose I never really arrived at this ‘philosophy – I simply never departed from it as my default. Again, I think it comes back to being a heathen, and I don’t have the inclination to look for whys and wherefores when there’s work to do in the present to make life on Earth liveable – and worth living – for those of us who are here right now. 6. What’s your basic philosophy or worldview about what the next century holds for our planet? What do you see as your role and approach to dealing with that eventuality? How did you come to this philosophy? I think the next century holds much hardship and suffering in store for our planet and the Earthlings that inhabit it. I know that many people are confronted by this view as they interpret it as needlessly negative or fatalistic. I don’t see it that way. I simply accept the realities as they appear before me, and the task that is presented to me: to do what I can to alleviate suffering where I am able to. The collapse of industrial civilization will enable much suffering of non-human species to be alleviated eventually, but in the meantime we are surpassing planetary boundaries that affect lives well beyond our species, so my commitment is to nurturing the Earth and my community in whatever way I can. I came to this philosophy through a lifetime of open-minded and open-hearted leaning, and a commitment to seeing the world as it really is, and not as I would wish for it to be. I care about my business and the goals it strives to meet — I’m an eco-friendly builder — and I feel positive and have great hope that this is a fantastic time to live because of what we are creating — something entirely new and not yet defined. Thanks, Overthinker — your article expanding on this is wonderful.